"Fling Story" was first performed in the Third Writefest at Progress Theatre, Reading, in 2008. It was directed by Carolyn Lyle and the choreography was by Emma Sterry. Karen was played by Christine Moran and Richard by Kevin Hallett. The play was also selected for the 2011 Waterford Festival of New Writing in Ireland and performed at the town's Garter Lane Theatre, directed by Eoin Lynch and Libby Seward. Karen was played by Maura Daly and Richard by Steven McCarthy. It was then staged by Stay on the Bus Productions (supported by Old Vic New Voices LAB) at The Troubadour, Earls Court, London, on 29th April 2013. The director was Sharon Burrell, assisted by Alice Williams. Karen was played by Lucinda Lloyd and Richard by Chris Polick. The play was last performed at Bread and Roses Theatre, London, on 25th and 26th April 2014. The director was Leigh-Ann Abela. Karen was played by Samantha Redford and Richard by Lee White. See below for an extract. Chris Polick and Lucinda Lloyd with Old Vic New Voices LAB (above). Photo courtesy of Sharon Burrell. RICHARD: Your habits began to annoy me. RICHARD: How you always rubbed your knees. KAREN: Your voice got on my nerves. RICHARD: You talked so quietly I could never hear you. KAREN: Always whining like a mosquito! RICHARD: I deplored your political views. RICHARD: You were further right than Genghis Khan! KAREN: And I hated your taste in music. KAREN: Tacky 70s disco hits! RICHARD: You dressed badly, put on weight. RICHARD: In fact, you were totally conventional! KAREN: A little yes-man in a grey suit! Soon they are shouting at each other at close range. KAREN: You never gave a toss about anyone else! KAREN: Let alone your own wife and children!! 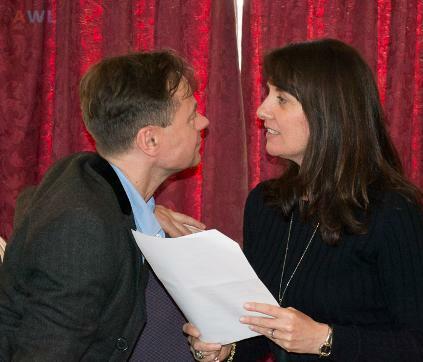 Left: Julia Haythorn and Lewis Rae in a rehearsed reading of Fling Story at Actors and Writers London, 2017. Photo: Paddy Gormley. 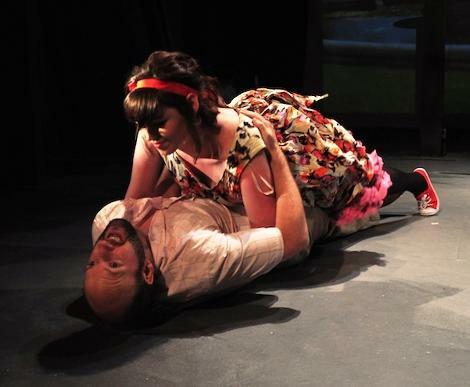 Right and top: Maura Daly and Steven McCarthy in Fling Story at the Waterford Festival of New Writing, 2011. Photo: Conleth White.